51 ha for 7 community supported farm projects secured by 2017. Kulturland eG was founded in 2013 and was legally registered in August, 2014. We see our roots in 40 years of experience with farm ownership associations on the bio-dynamic scene. 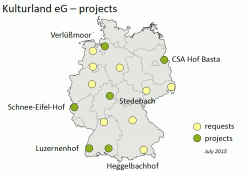 185 of these non-profit farms currently still exist in Germany, the majority of which were founded before 1990. In a preparative study (which was also translated into French and English) we analysed the current land market situation and alternative tenure experiments in Germany, within the context of the current financial crisis. We then developed the blueprint for a new organization which would “mainstream” the idea of non-profit farm associations and make this concept relevant to the wider society. We preserved the basic invention of “Umkreisbildung” – empowering the farm’s surrounding community to take over responsibility and land tenure – and embedded it into a nationwide professionalized structure which takes care of the necessary legal, financial and communication work. Furthermore we expanded the financial model from solely donations to accepting temporary investment. Our goal is to preserve farmland for community-connected ecological farming on a long term basis, thereby developing a new model of tenure which might also influence land market regulations on a political level. We encourage citizens to take responsibility for their share of German farmland (this is 0.2 hectares on average). They can do this by signing up to shares in the cooperative and thus becoming collective owners of the land. We call this “Allmende 2.0” (Commons 2.0). Aside from some funding for the preparatory study, the setup of the organisation was mainly done through the voluntary work of the board and team members. We acquire farmland and rent it to community connected eco-farmers on a long term basis. We regularly provide our members with news from the farms so they are aware of what their money is doing. In order to give members some flexibility in their investment we take care to ensure that any shares that are recalled can be sold on to a new member. In a worst case scenario, if we are forced to sell off farmland to pay out leaving members, we grant farmers a pre-emptive right at the initial purchase price. A cooperative share is 500 €. There is no interest. After a minimum of 5 years, members can withdraw their shares annually on 6 months’ notice. Loans can be secured by a land registry charge. We also enable the tax deductible donation of shares for members who, after some years, have convinced themselves of the necessity of durable land security for their farmers. For this option we cooperate with Schweisfurth foundation from München. Kulturland eG (= eingetragene Genossenschaft) is a cooperative. Each member has one vote in the general assembly, regardless of the number of her or his shares. This reflects the equal right of access to land for each human being, and gives members the feeling (and the fact) of direct land ownership. The general assembly elects the supervisory board which designates the 3 managing directors. Currently these are Titus Bahner, Thomas Schmid and Stephan Illi. Luzernenhof farm near Freiburg, comprising 32 ha in total, was converted to bio-dynamic farming in the 1980s. A young group of farmers and gardeners took over from the family that owned it in 2012 and started a successful CSA project with milk and dairy products, meat, honey, grains and a large variety of tasty vegetables. It is the only dairy farm with grazing cattle in the region. We helped to convert the whole farm to a common ownership model. The group now faces the challenge of restructuring their pioneering efforts to ensure long term viability. Heggelbachhof farm at Lake Constance is a well established 160 ha bio-dynamic community farm run by 5 families. They produce grains, potatoes, milk and dairy products, beef and pork meat and large scale vegetables for regional wholesalers. The farm welcomes school classes and visitors around the year. Kulturland eG helped them to save 15 ha of their core land. Basta CSA farm close to the Polish border is run by a young farming group. They provide a large variety of tasty vegetables for 300 consumers in Berlin. Their entire fields (9 ha) were sold by the East German privatization agency BVVG and has been secured by us by collecting shares mainly among their customers. Verlüßmoor is a 270 ha family/community farm on moorland near Bremen in the North, producing milk, eggs, beef, vegetables and wild bird habitats for the local people. We secured 6.5 ha land for them. Hof Stedebach in central Germany was an access-to-land-project 30 years ago for a young family that managed to set up a new farm with the help of friends and consumers. Nowdays it has 120 ha, produces milk and grains, grows vegetables for a nearby CSA and works with school classes. After two years of preparation we established the cooperative in mid 2014. In the first 18 months we managed to secure 45 ha of farmland in 6 projects all over the country with a total value of €1.3 million. A serious hurdle at the beginning was the German land market regulation that prohibited us from acquiring land because the cooperative itself is not an active farmer. In negotiations with the authorities we managed to develop a contractual model which allows us to purchase land by establishing a joint holding society with each farmer.